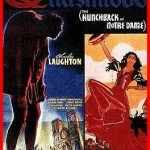 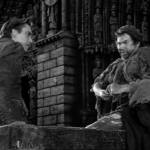 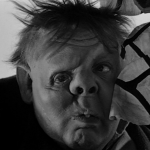 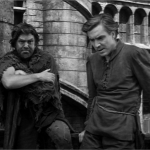 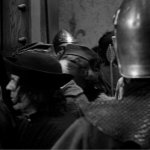 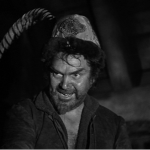 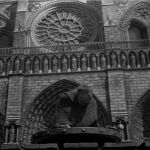 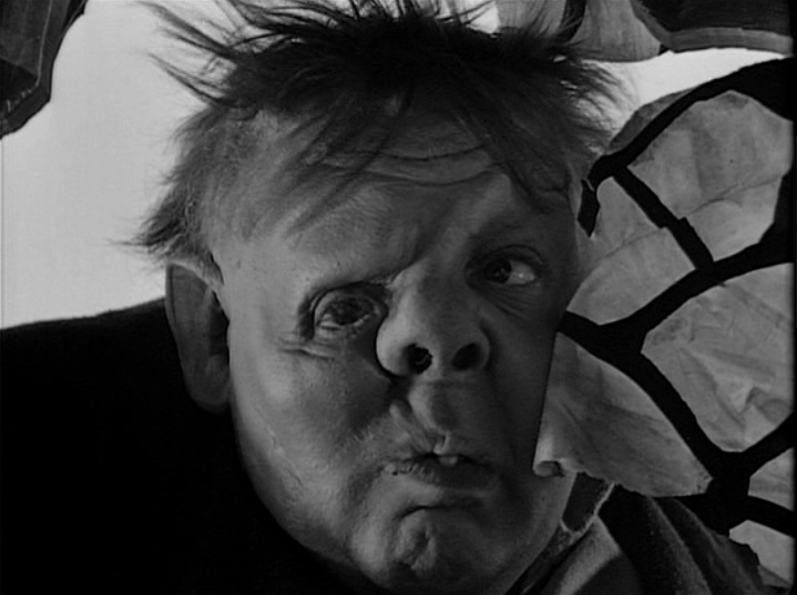 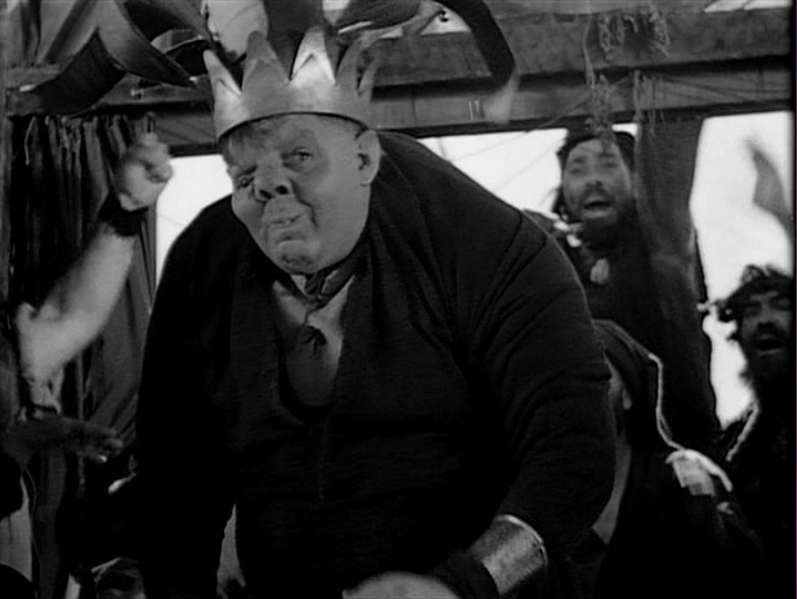 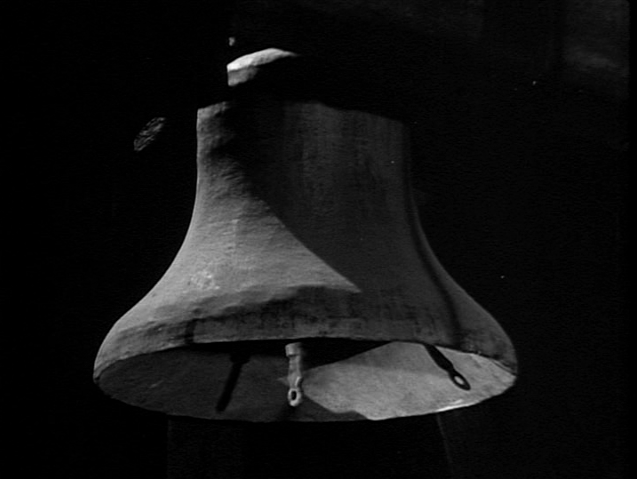 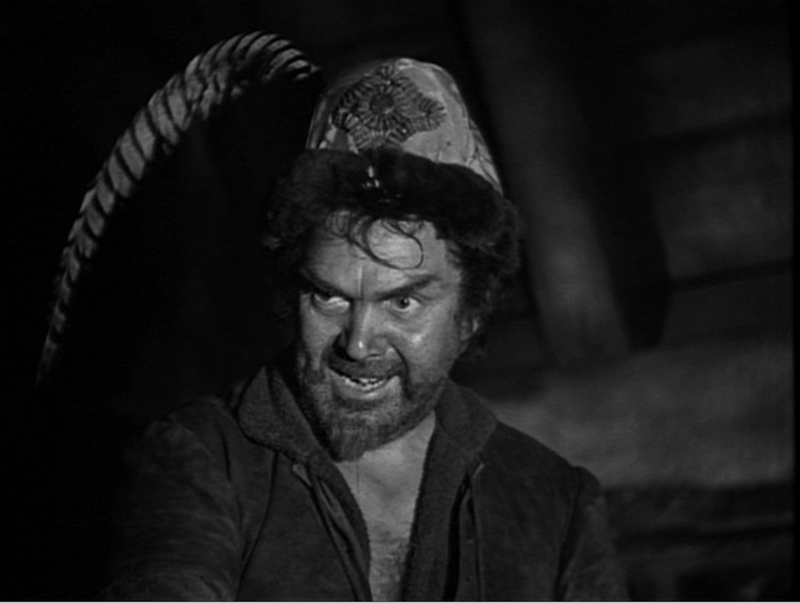 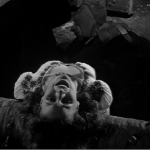 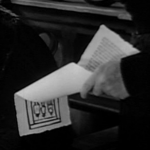 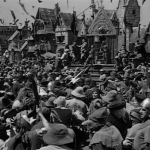 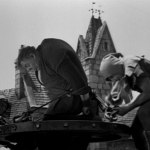 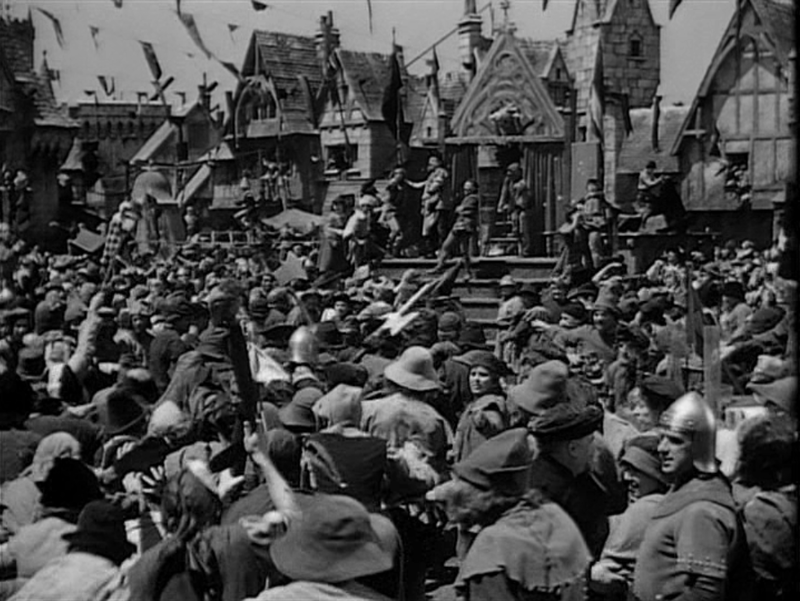 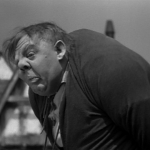 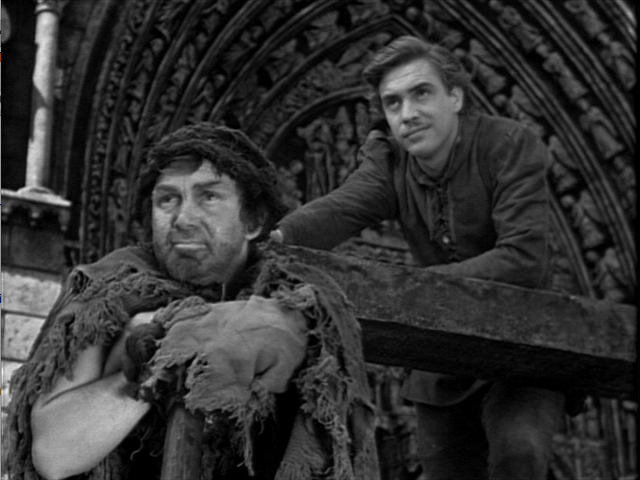 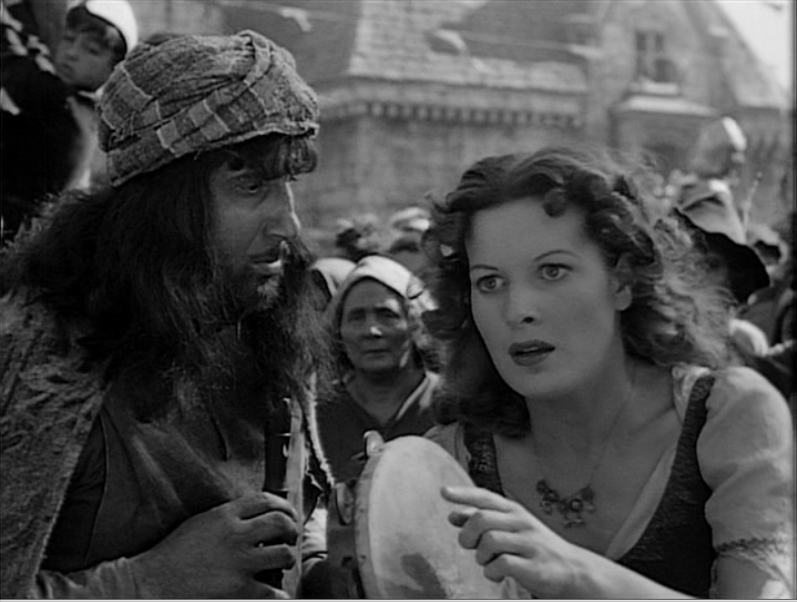 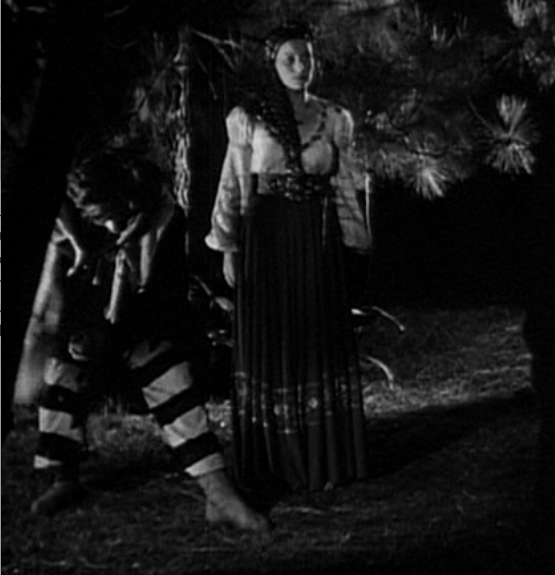 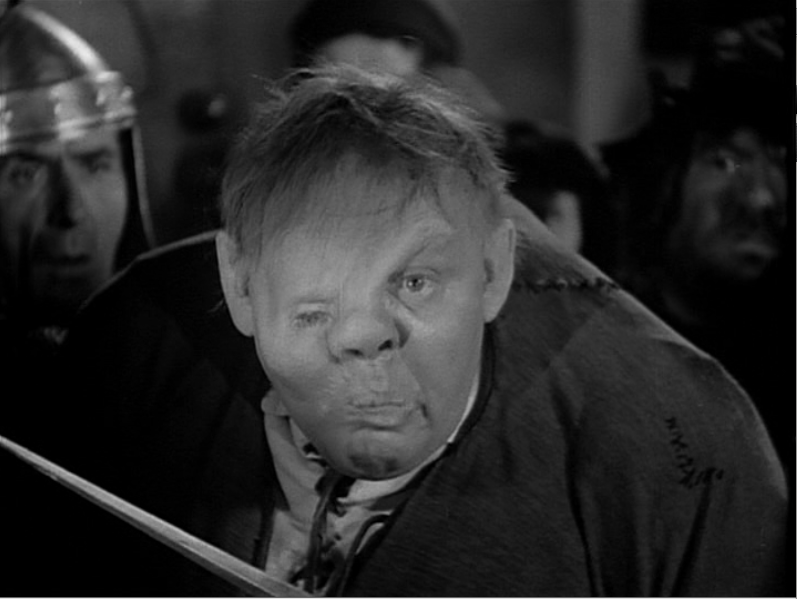 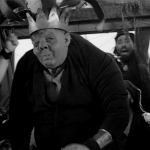 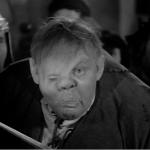 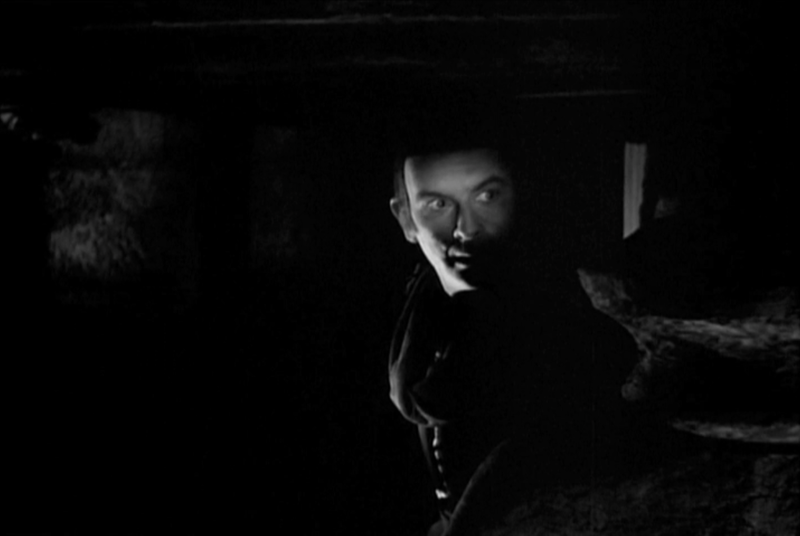 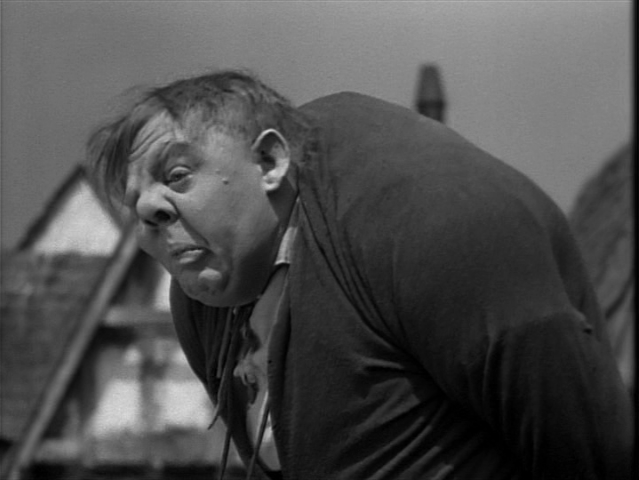 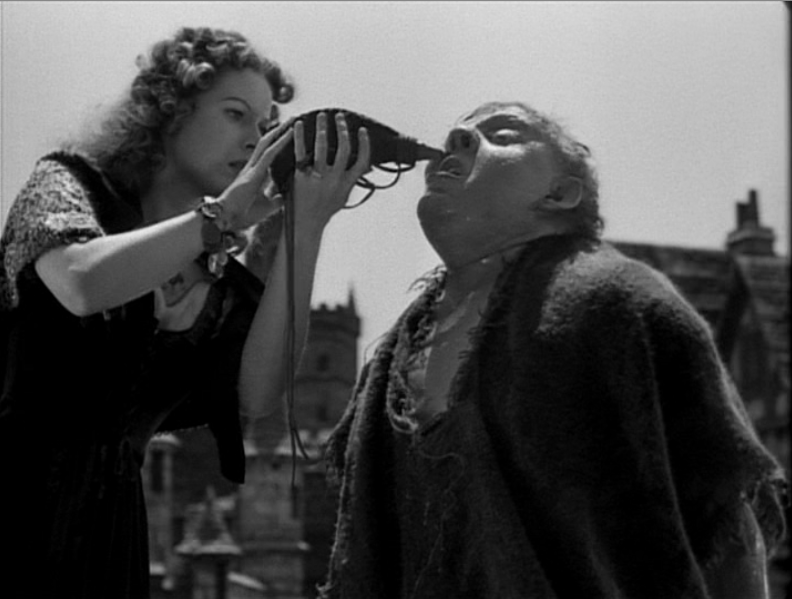 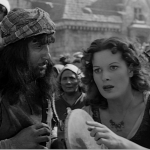 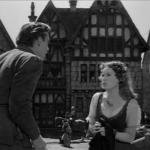 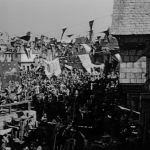 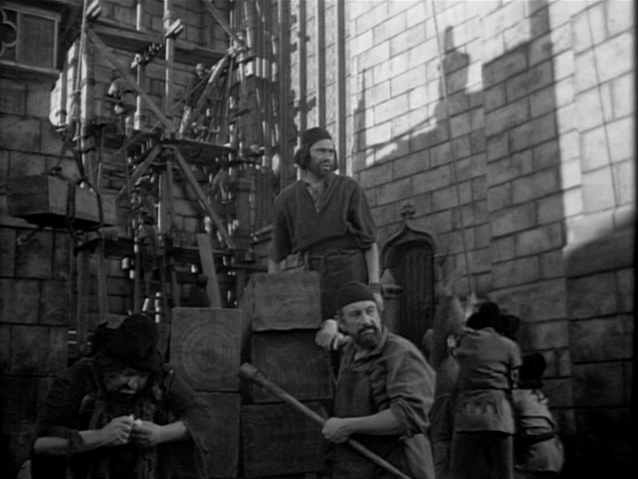 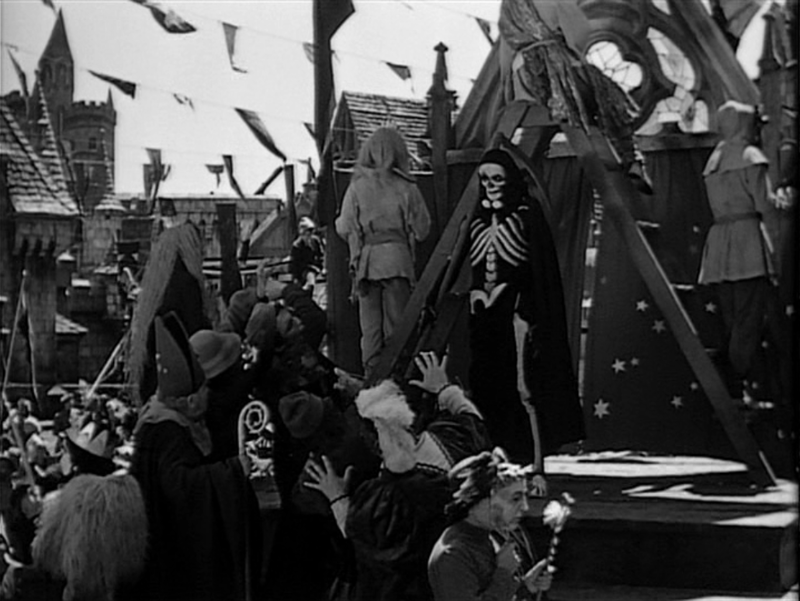 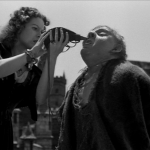 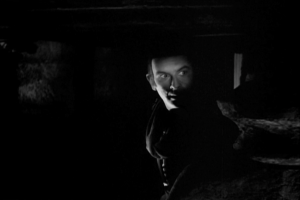 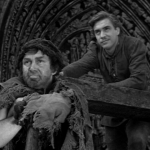 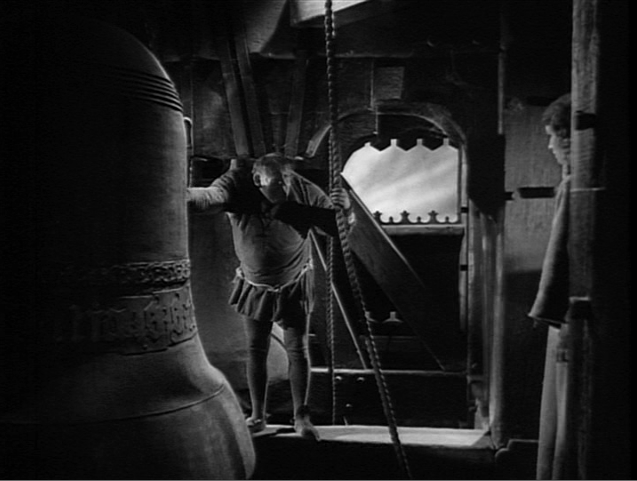 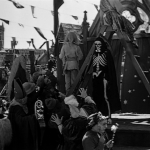 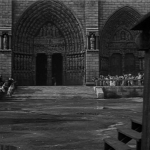 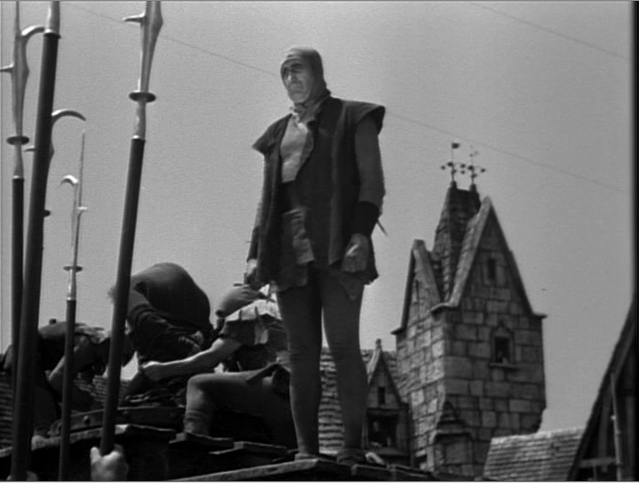 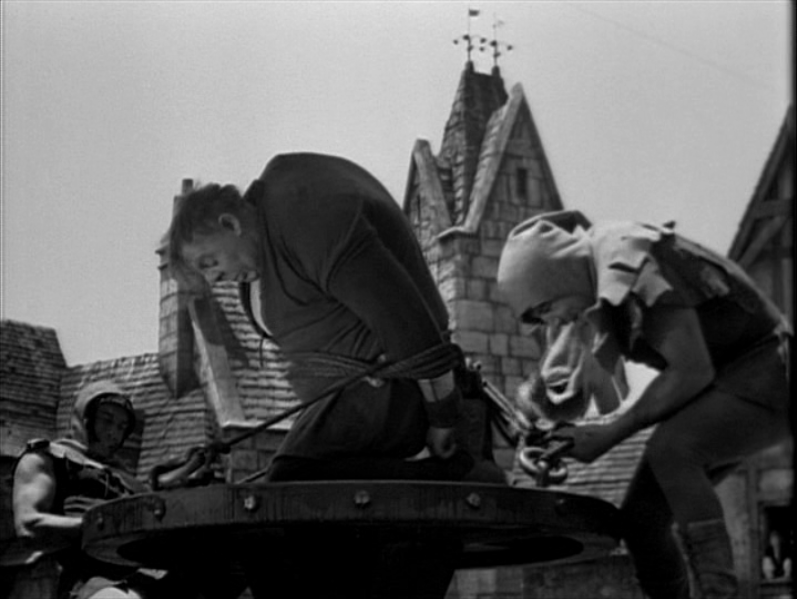 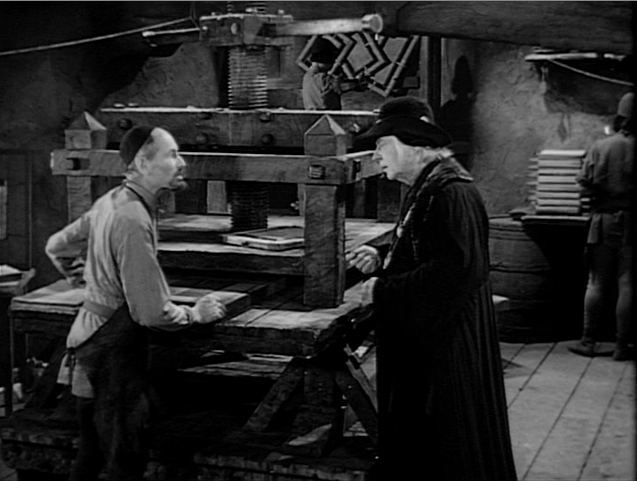 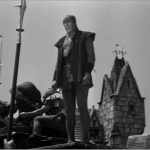 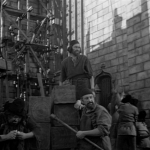 If you didn’t know any better, you might think that the 1939 version of “The Hunchback of Notre Dame” was filmed on location, I know that’s what I thought at first but that is not the case. 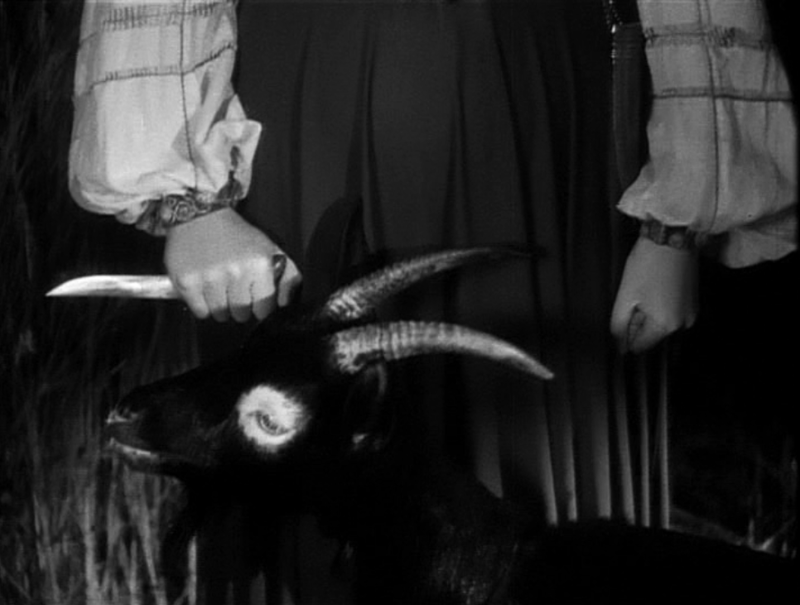 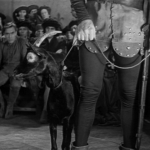 This film was shot completely on set at the RKO ranch in the San Fernando Valley. 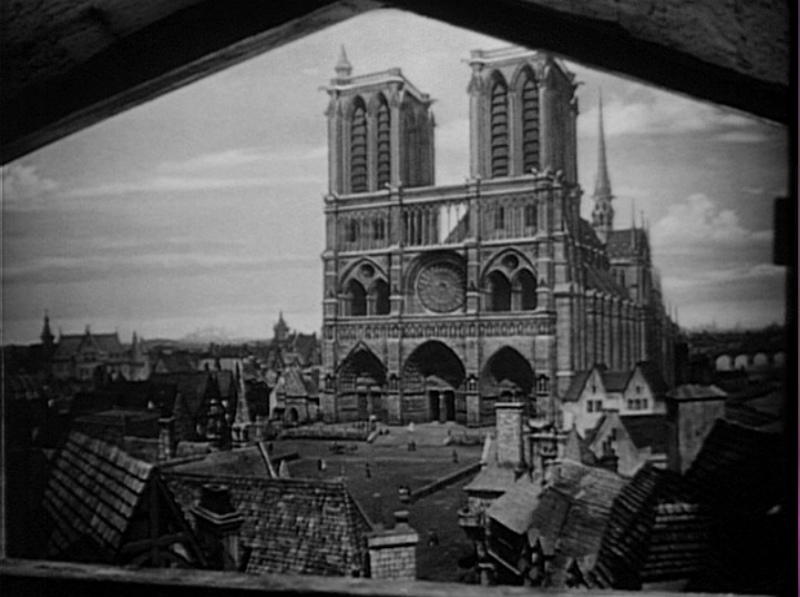 The sets were designed after a 400 year old wood carving of Paris. 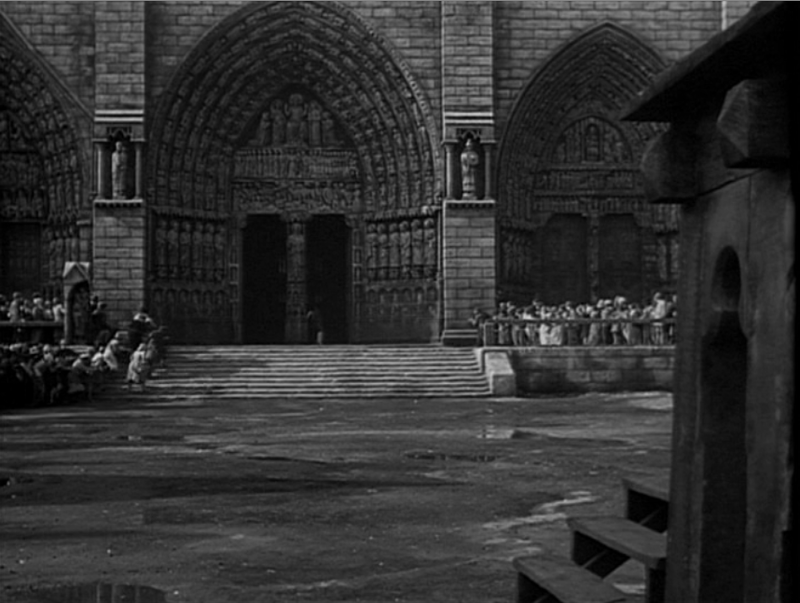 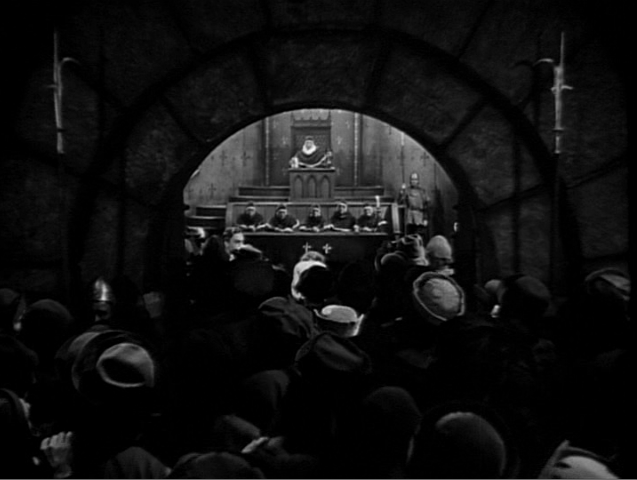 The sets are one of the strongest visual aspects of this movie. 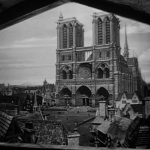 They transport the viewer to 15th century Paris, with the narrow streets, Notre Dame in all its’ glory, with its’ accurate nave and it’s raised platform complete with stairs, Both the raised platform and the stairs are no longer a part of the actual Notre Dame due to time and erosion. 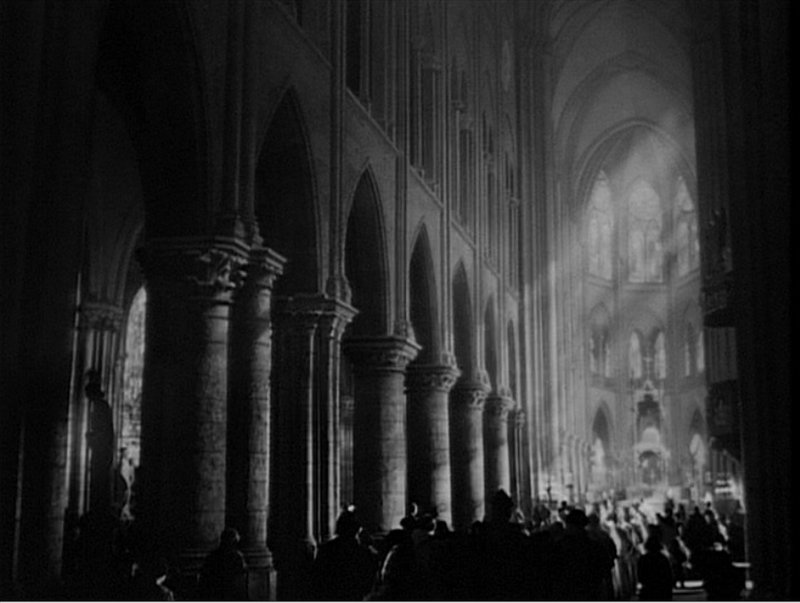 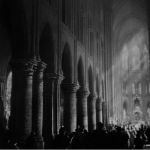 Erosion and structural changes to Notre Dame are some of the reasons why films shouldn’t take too much lead from Notre dame in it’s modern state if their doing a period piece (I’m looking at you here Disney). 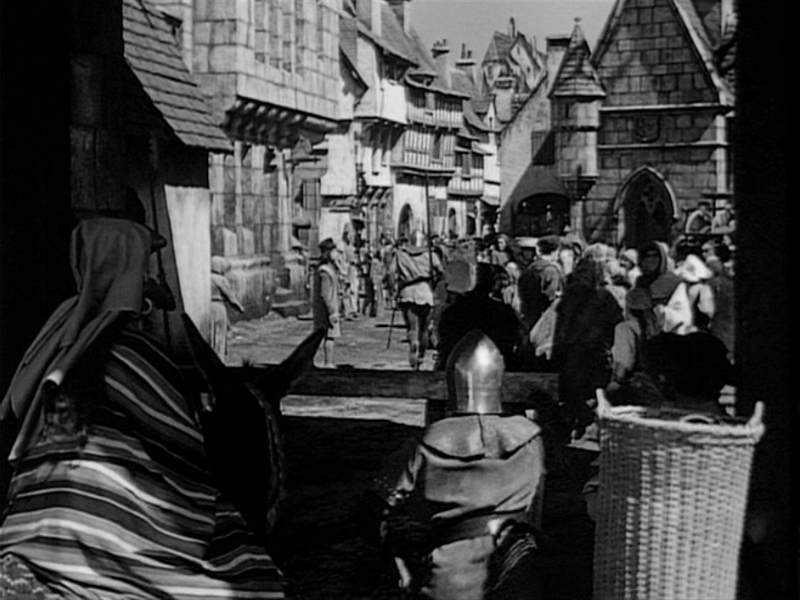 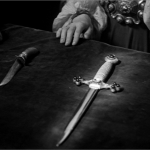 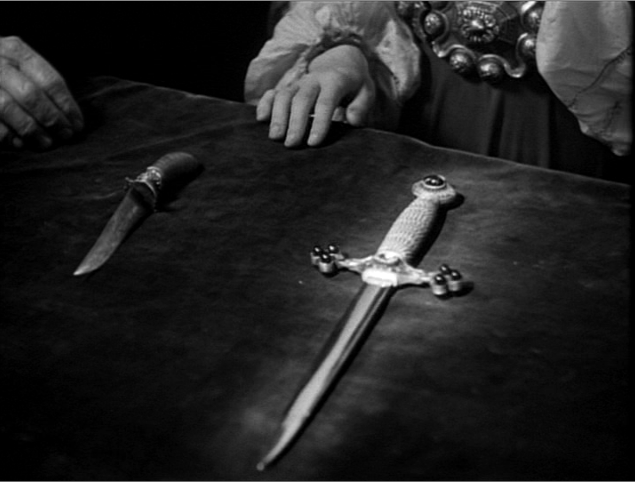 All the attention to the details of the sets are one of the strongest aspects of the film and this helps keep the film in classic movie nostalgia. 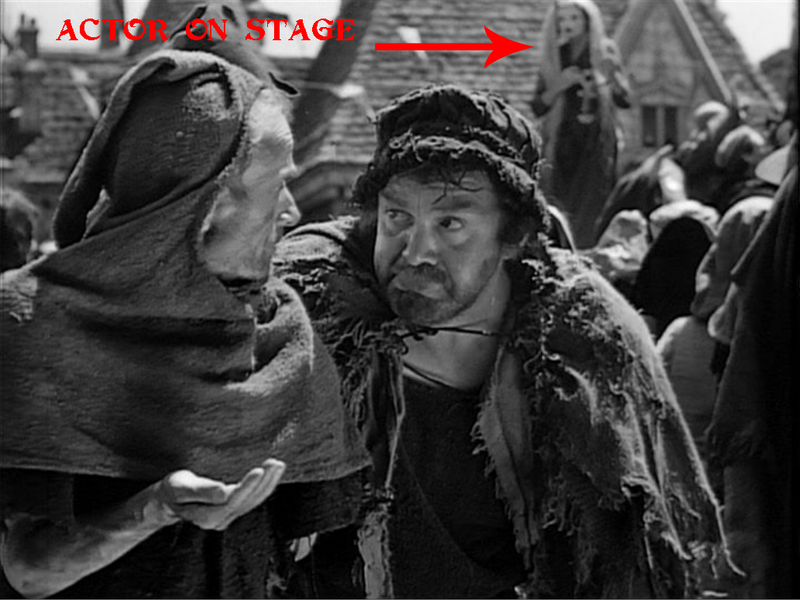 So next up is staging, where things, mainly actors, are position in scenes of a movie. 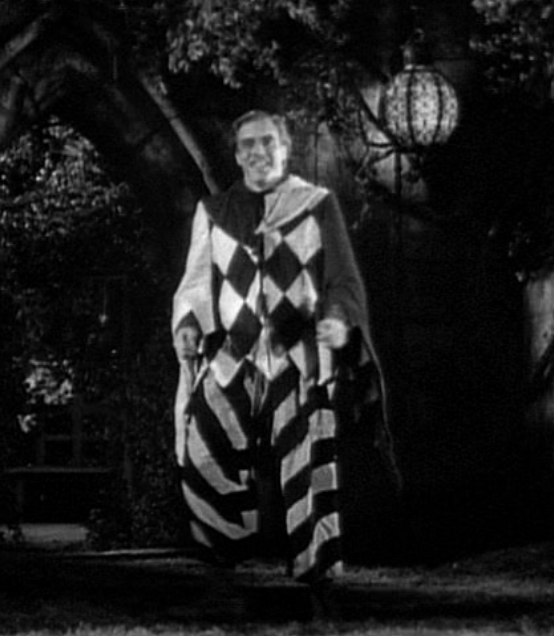 As I was looking at the costumes I noticed something, a lot of the shots are medium or close up unless it was a big epic scene or an establishing shot . 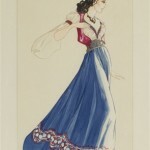 This makes it hard to get pictures of costumes but it also makes staging difficult to review. 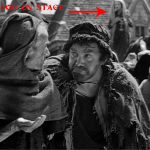 Another factor that makes staging reviewing difficult is that the editing cuts between shots are very frequent, though the cuts are not insane or abnormal. 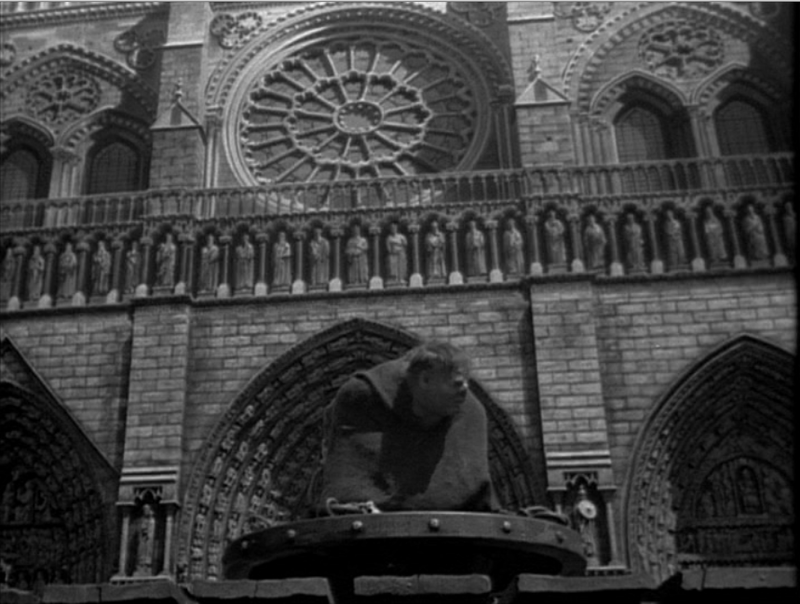 Also other than establishing shot you don’t get a feel for the spaces the characters occupy, not even Notre Dame. 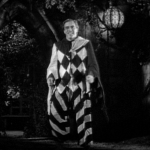 So it’s hard to gauge the characters’ movement in the film space. 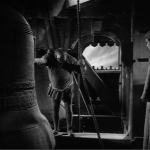 For the most part I say that the characters use the spaces logically but it’s hard to gauge where the characters are in relation to each other in the space in a given scene. 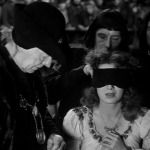 A good example of this is during the Feast of Fools. 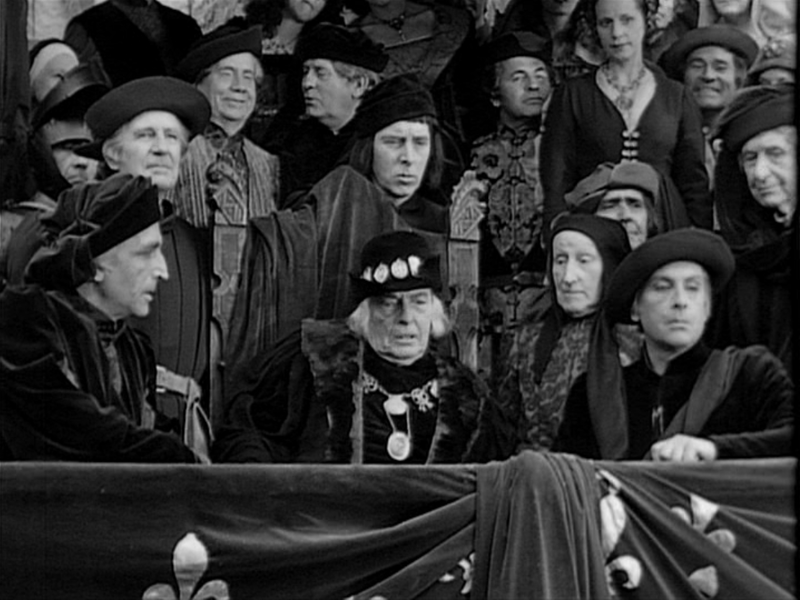 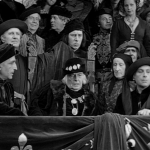 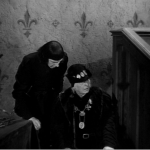 First you see Louis and Frollo sitting in the royal box watching the festivities. 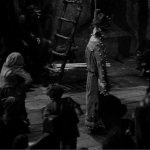 From their vantage point they can see Gringoire’s play. 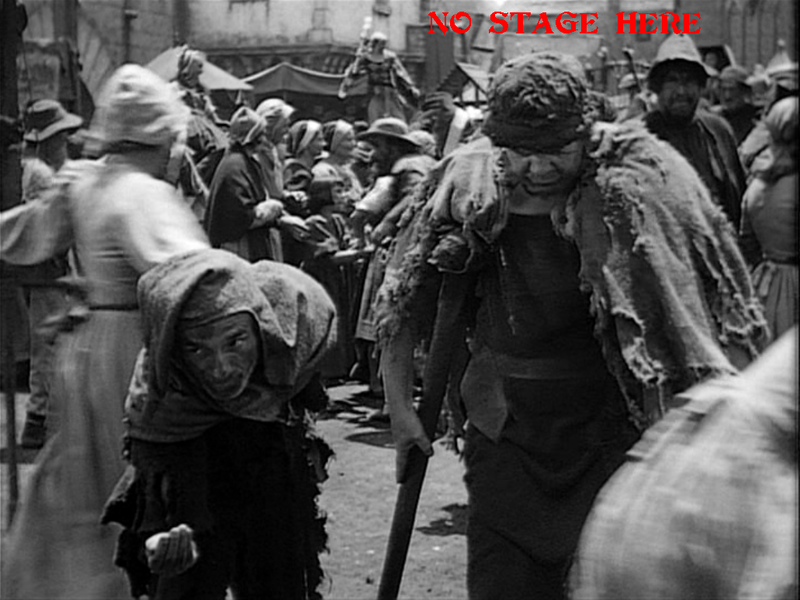 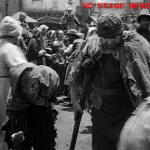 The beggars start to complain that they’re not get money because of the play. 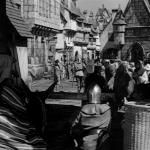 (Edit Alert; in the longer shot as Clopin walk up you can’t see the stage but when the scene cuts to a medium shot of Clopin and the beggar the stage can be seen). 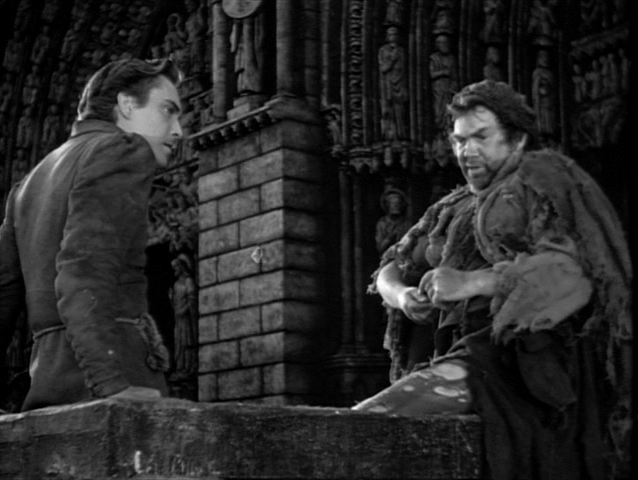 Clopin puts an end to Gringoire’s play and then on the same stage the King of Fools contest begins. 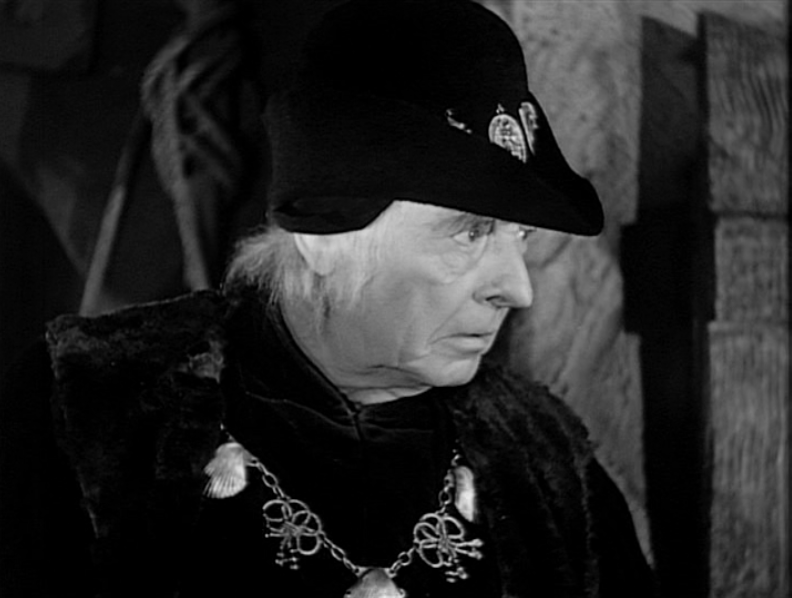 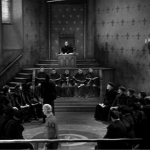 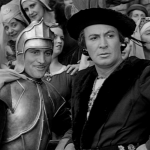 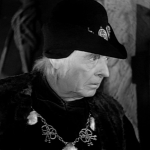 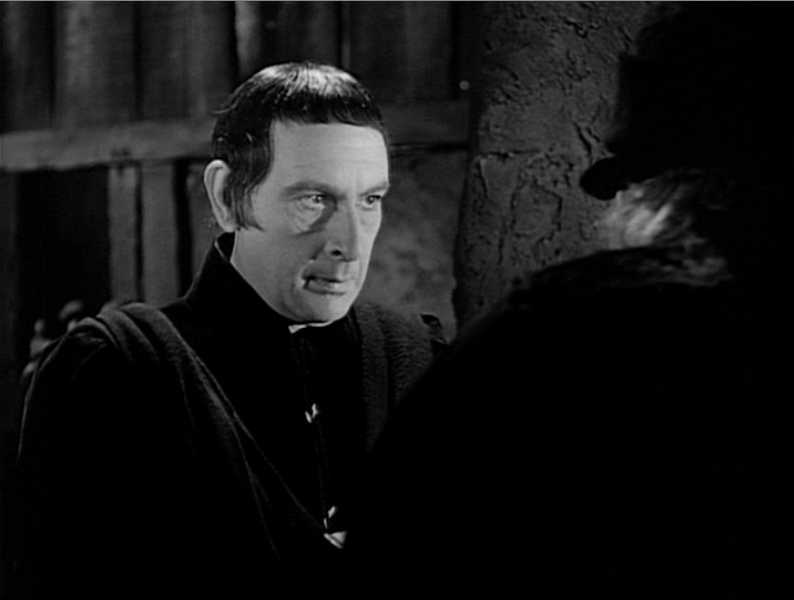 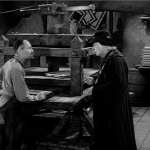 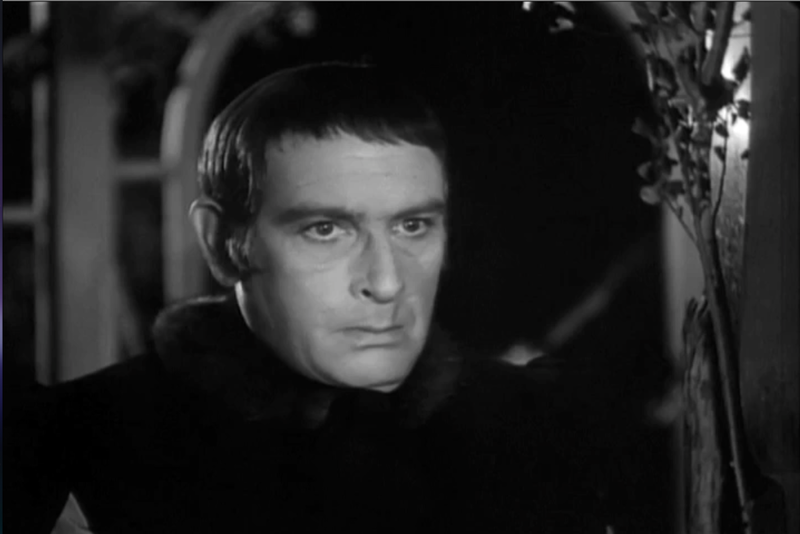 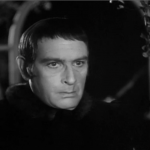 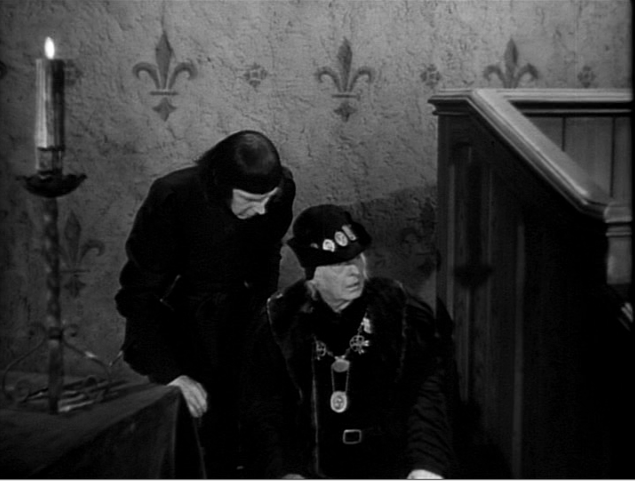 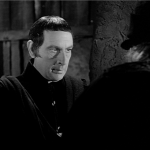 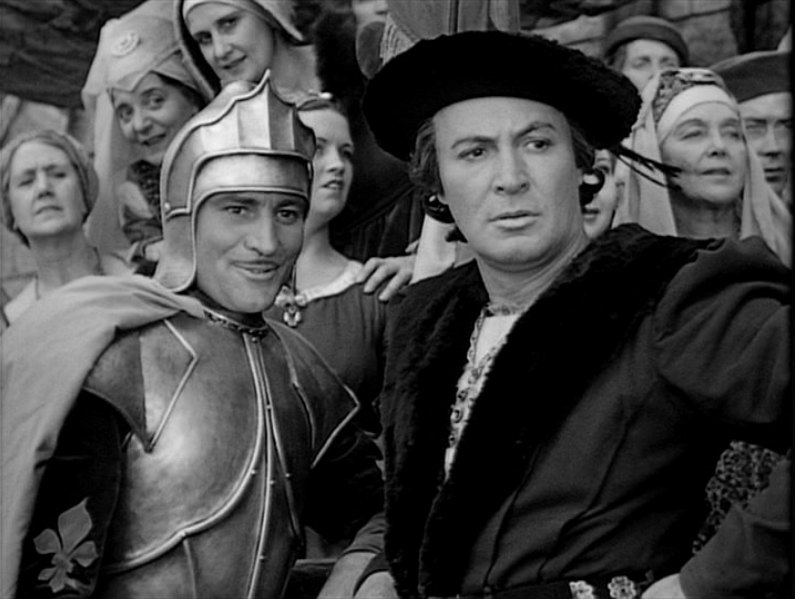 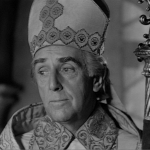 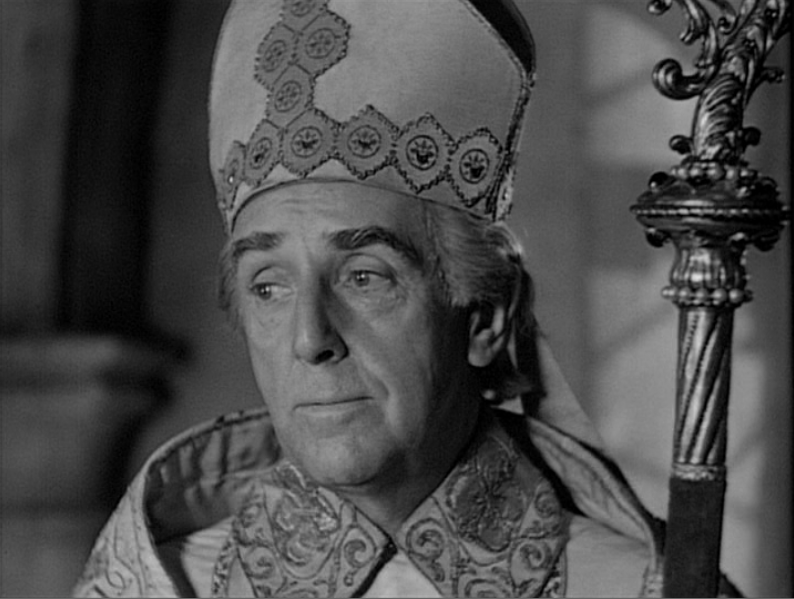 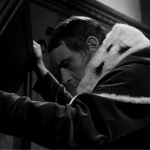 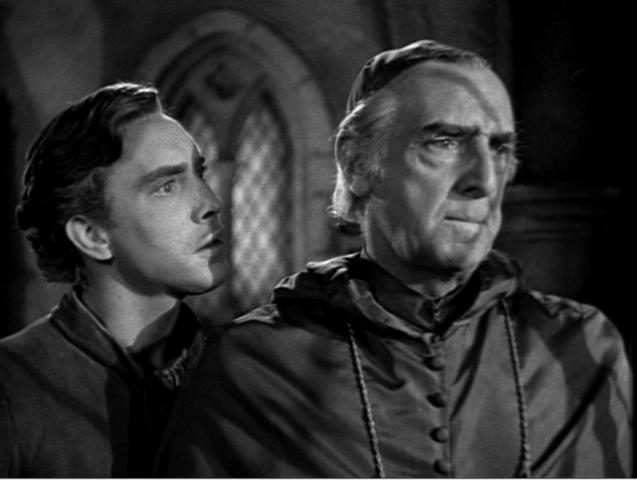 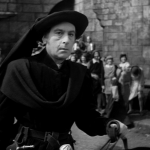 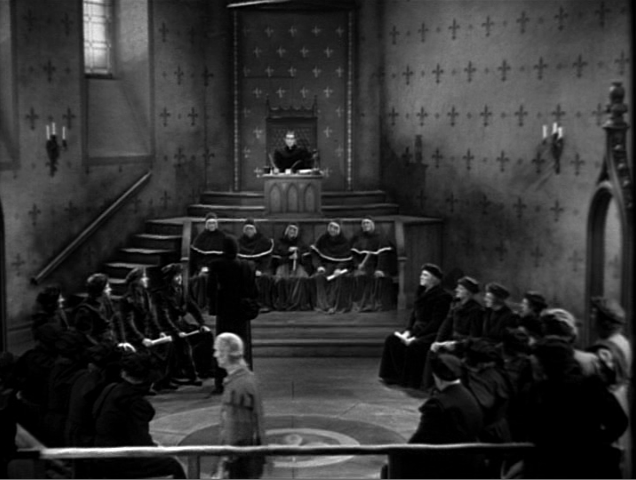 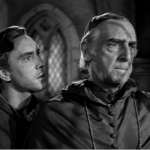 As the contest starts we Louis and Frollo talk about it how ugliness is fascinating and how the noble seem interested. 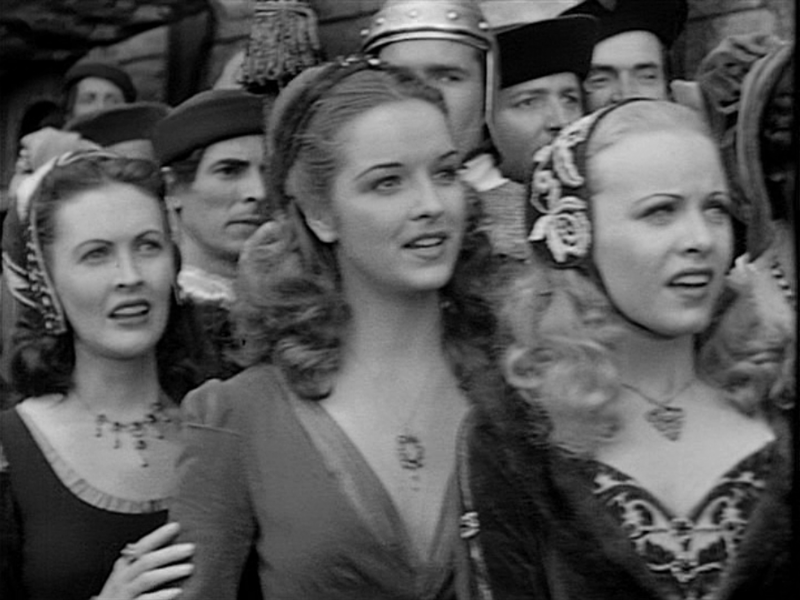 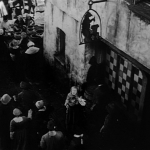 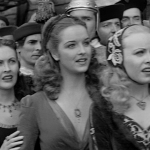 The scene cuts to nobles looking at the stage, it is in this line up of nobles that Phoebus is seen making a comments about Esmeralda who is dancing. 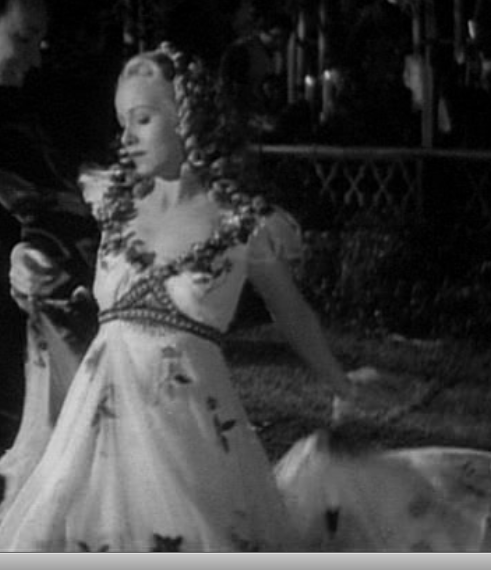 As she dances it’s hard to make out where the stage is but it seems to be to left. 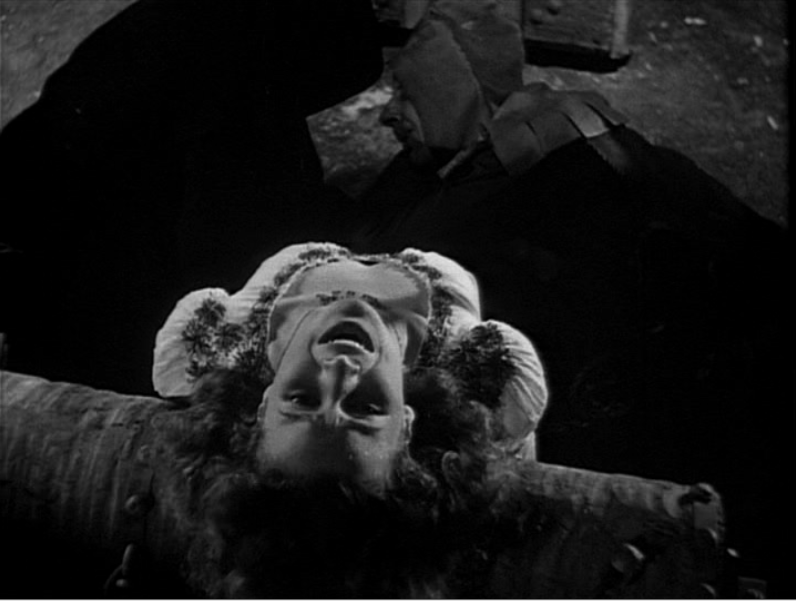 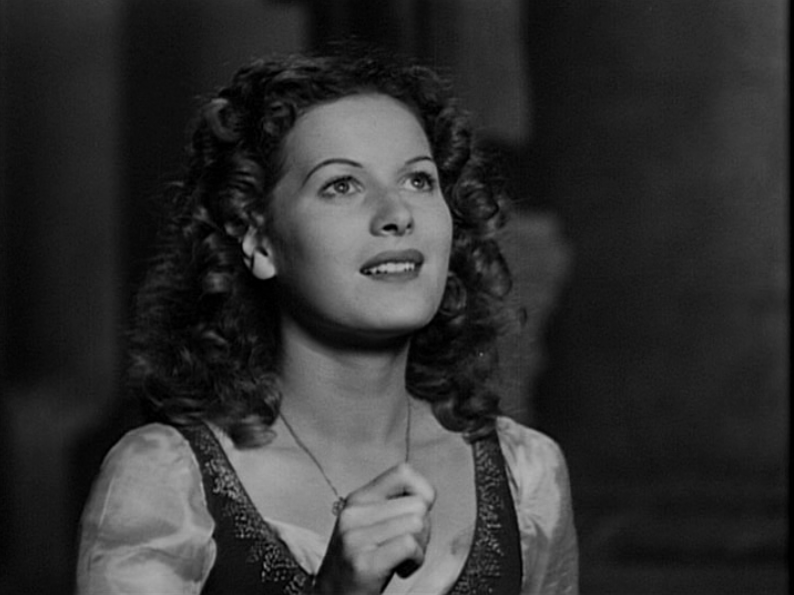 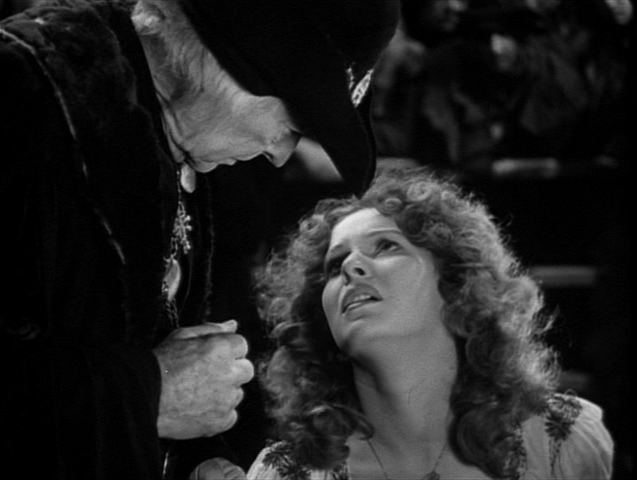 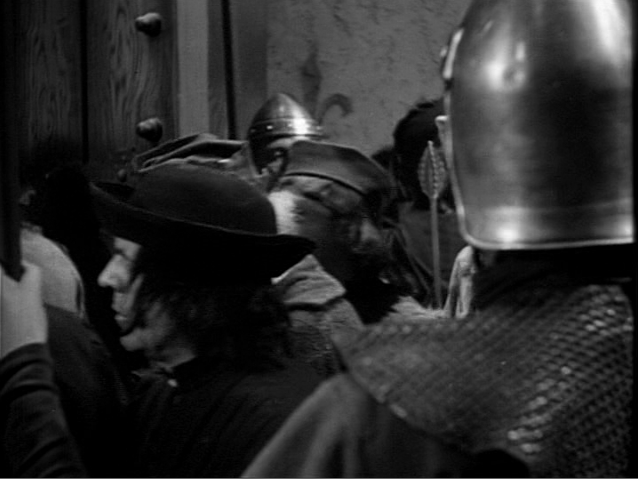 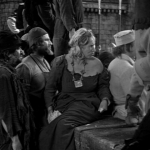 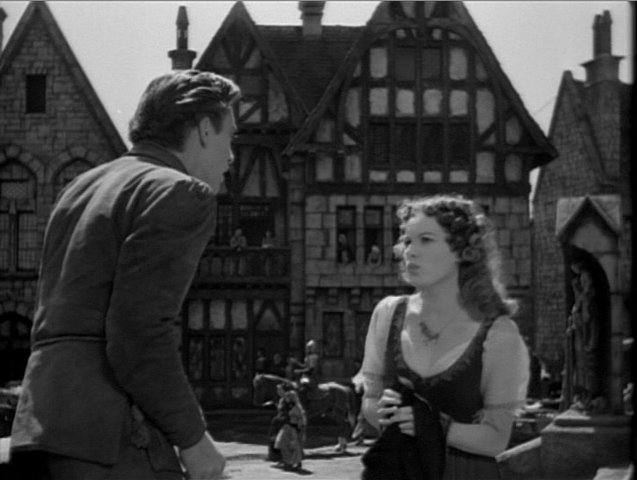 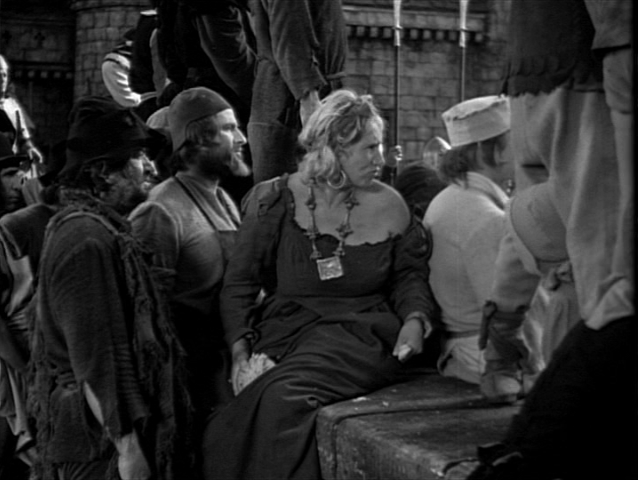 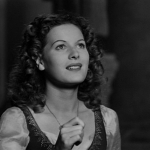 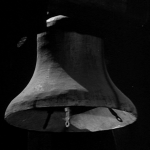 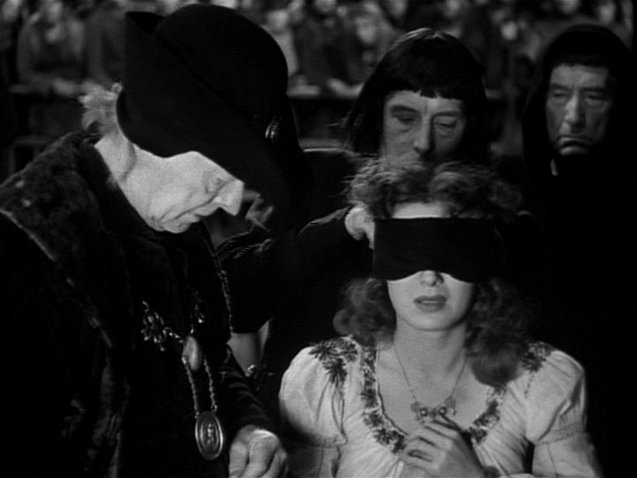 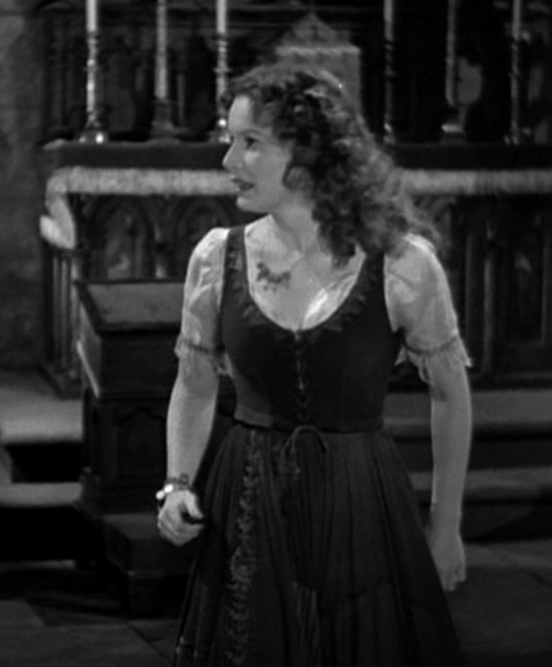 Louis and Frollo in their box are watching her and looking slightly to the right, as well as Gringoire. 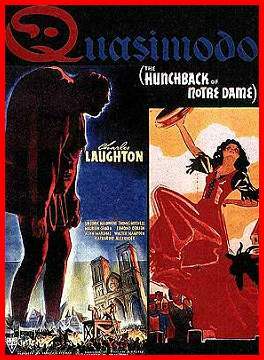 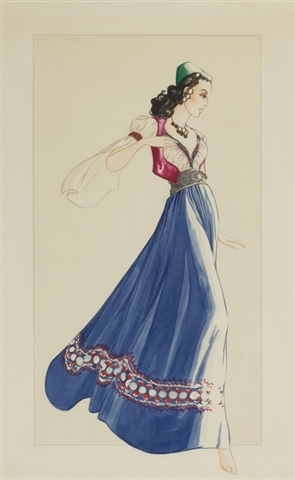 Louis and Frollo have to be somewhat close to her as Louis throws her some money without much effort and Quasimodo is hiding under the royal box and Esmeralda can see him staring at her. 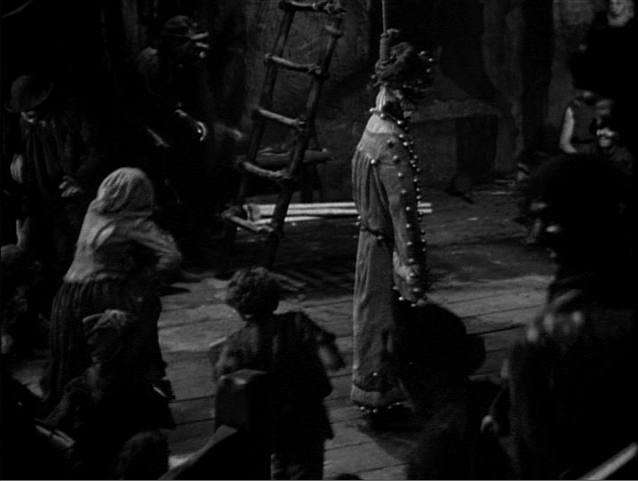 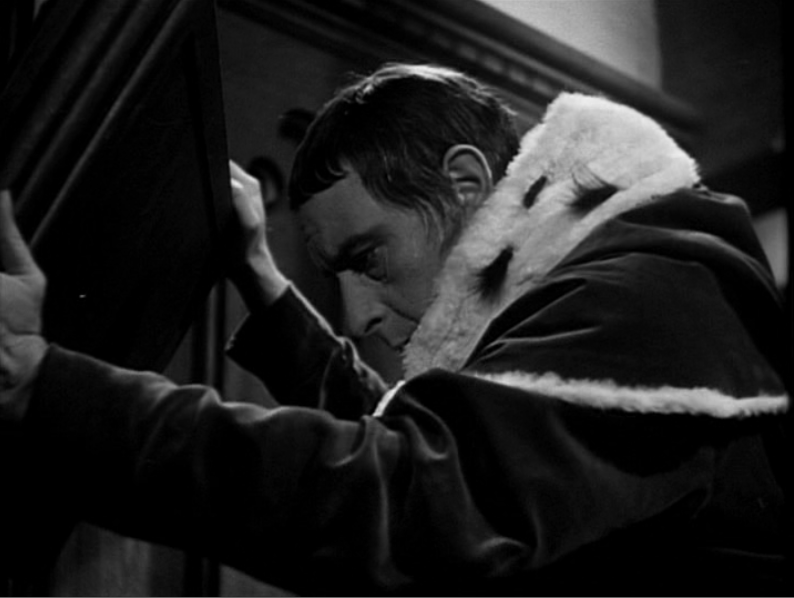 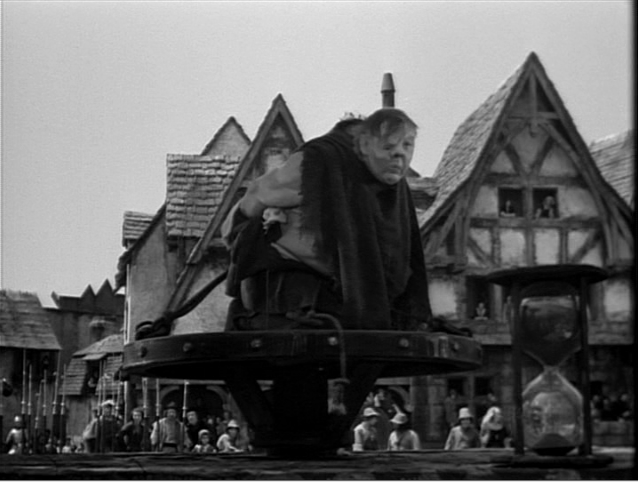 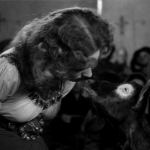 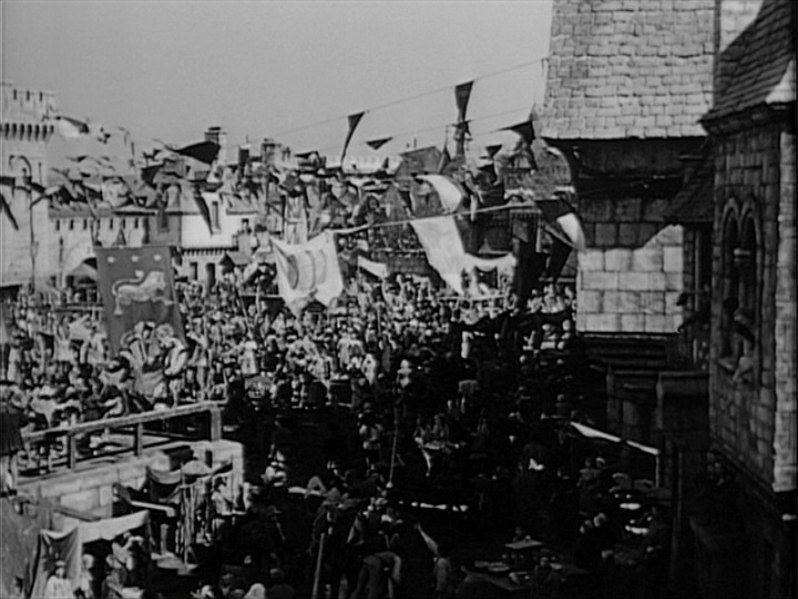 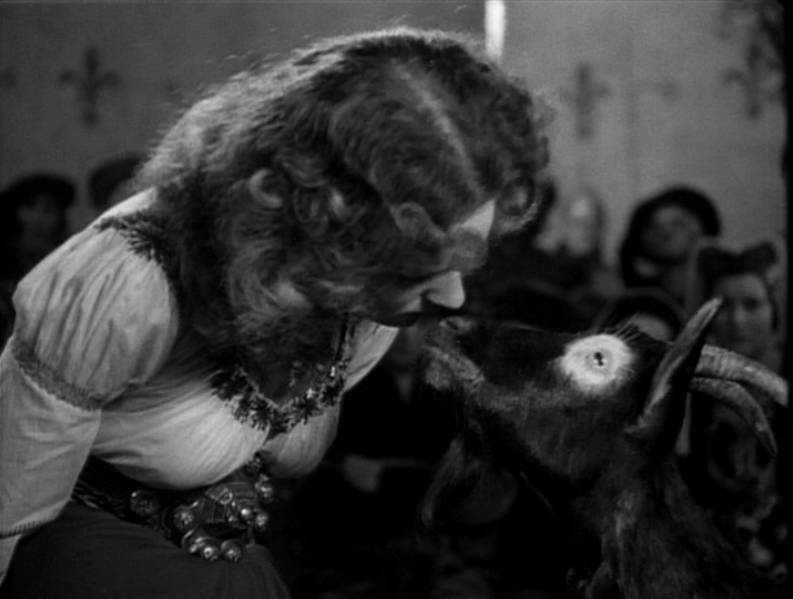 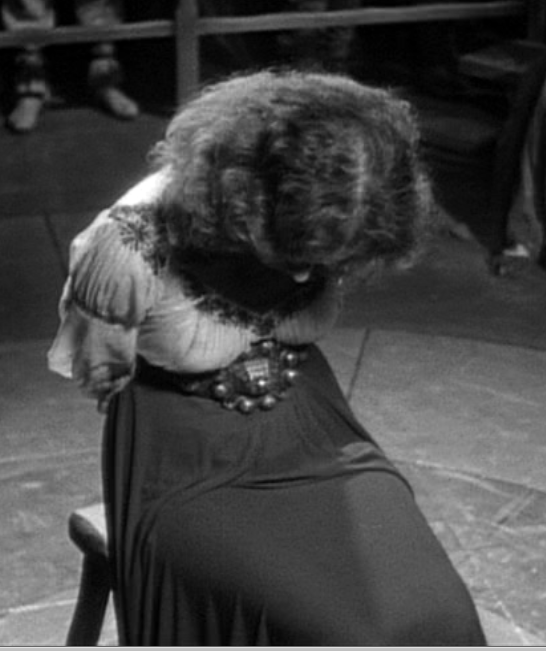 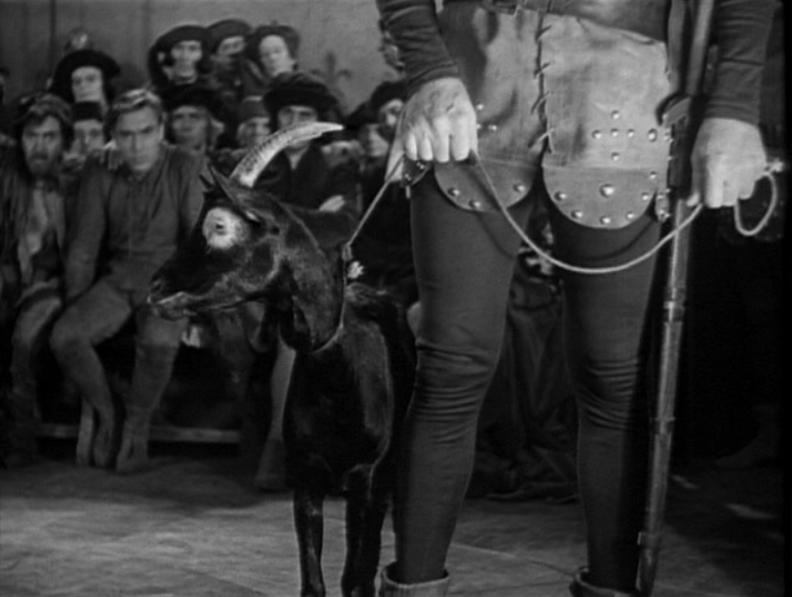 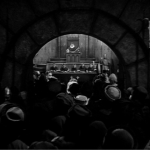 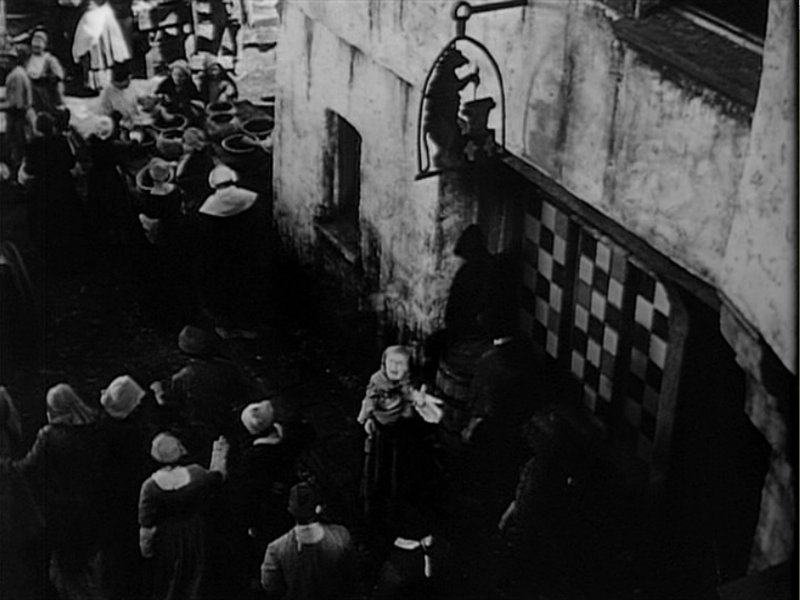 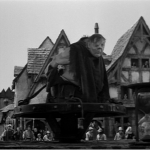 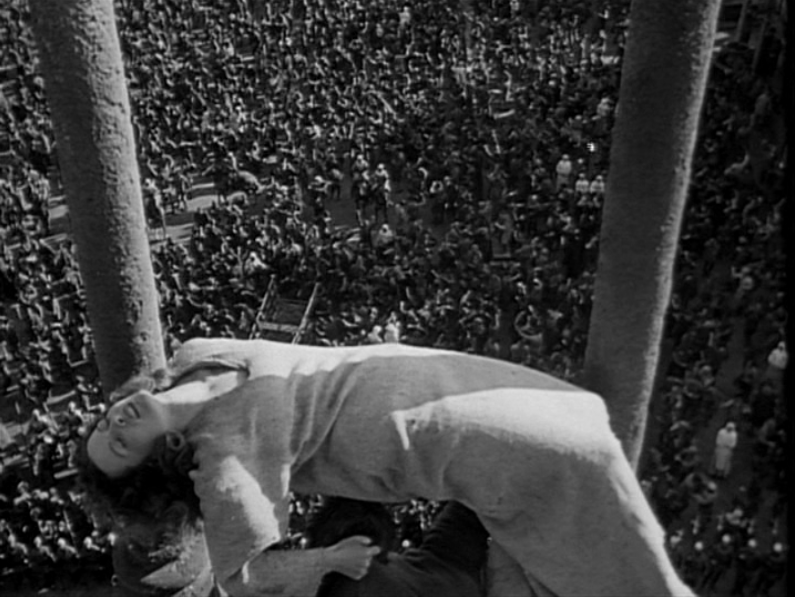 The crowd then drags Quasimodo to stage which looks like a long distance from the box.